When Michelangelo Antonioni’s sixth film, L’Avventura premiered at the 1960 Cannes Film Festival, it was met with catcalls, but it was a critical darling that went on to captivate audiences all over the world thereby establishing its director’s auteur credentials. It’s a film kickstarted by a mystery that segues into a love story immersed in his trademark existential ennui often reflected in the architecture that surrounds the characters. Anna (Massari) and her girlfriend Claudia (Vitti) go on a cruise off the coast of Sicily with the former’s boyfriend Sandro (Ferzetti) and a few of their friends. It’s been a month since Anna and Sandro have seen each other and she is rather unhappy. On the boat, she acts moody and, at one point, spontaneously jumps overboard for a swim. She even lies about encountering a shark in the water. They eventually disembark on a rocky volcanic island where Anna and Sandro talk things out. He takes a nap and she goes off for a walk never to be seen again. Much like with Picnic at Hanging Rock (1975), L’Avventura features an enigmatic woman that disappears in a very imposing and unforgiving environment while those that knew them search for and ponder their disappearance. Unlike Picnic, the search does not become an all-consuming passion for its characters. During their journey, Sandro and Claudia end up falling in love. Anna’s disappearance provokes countless theories: murder? Kidnapping? Suicide? Accidental death? We never find out and eventually the mystery gives way to a romance between Sandro and Claudia, but Anna’s presence continues to haunt the film and its characters. Even though Sandro and Claudia are alienated characters, the film is not about alienation and Gabriele Ferzetti and Monica Vitti do an excellent job of conveying the jumble of emotions their characters experience after Anna’s disappearance. They feel adrift only to find each other because of the lack of Anna’s physical presence. The composition of each frame is like a work of art as Antonioni knows exactly where to position each actor in relation to their environment for maximum effect. It is significant how actors are placed together in the frame as is their relationship to their surroundings. 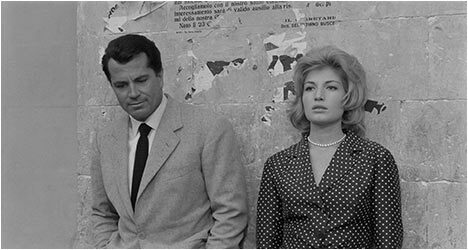 L’Avventura could be easily dismissed as nothing more than the petty problems of the idle rich, but Antonioni’s film digs deeper to examine their complex emotions. It’s a challenging film that doesn’t offer any easy answers, but provides plenty of clues in what people say (or don’t say) and how they act. It forces us to pay attention to the places and spaces that its characters inhabit because they too offer possible clues. Ultimately, the mysterious disappearance of Anna isn’t really about what happened to her, but how her absence affects those that knew her. The detail and depth of image on this Blu-Ray transfer is incredible, easily surpassing Criterion’s previous DVD incarnation. Definitely worth an upgrade for any fan of this beguiling film. There is an audio commentary by film critic Gene Youngblood. He puts L’Avventura in context of its time and Antonioni’s reputation as well as its infamous reaction at Cannes. He examines the role architecture plays in the film and points out that the images narrate the story as well as what the characters’ behavior tells us. This is a very informative and well-researched track. “Antonioni: Documents and Testimonials” is an hour-long 1966 documentary on the filmmaker with interviews with friends and colleagues. With revealing footage of the director on set making a film, this doc. takes a fascinating look at the man at the height of his powers, starting with his early life and working through his career up to that point. “Jack Nicholson Reads Essays by Antonioni” features audio clips of the veteran actor reading from some of the publicity material for L’Avventura, the director’s views on film acting, and finally, most interestingly, Nicholson eloquently recalls some of his experiences working with the man. New to this edition is “Olivier Assayas on L’Avventura,” a visual essay featuring the French filmmaker analyzing the film and offering some good insights into its themes.